I wanted a really quick and easy way to stay up to date with new releases of the Meteor packages that my apps depend on. 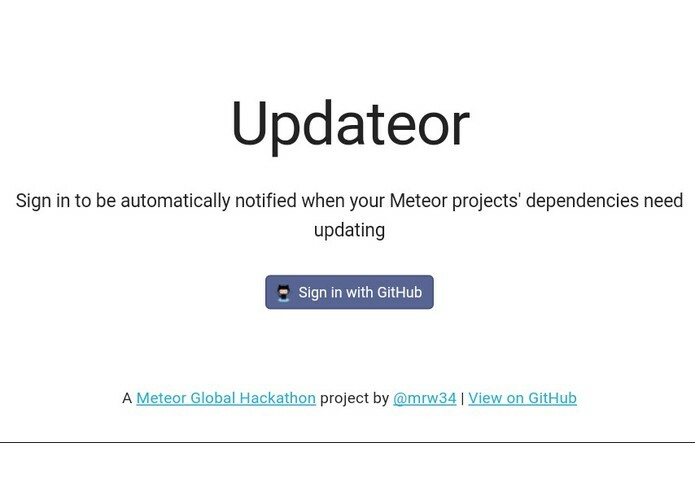 It automatically discovers your Meteor projects on GitHub and checks daily if any of their dependencies have updates available. If so then it emails you with the details and a command you can paste into your terminal to update the packages. I built it using vanilla Meteor 1.2 (no third-party packages) and ES6. It was my first app using ES6 but a good learning experience. It's under 100 lines of code and took less than 6 hours. I hope it's an accessible project for anyone getting started with Meteor. There are some similar services available but none written in Meteor or as simple to use. How much you can achieve with very little Meteor code! A prettier UI, support for Bitbucket and maybe automatically generated pull requests. It was #builtwithmeteor by me!